Building Engaged Team Performance explains the next wave of business improvement: driving breakthrough gains by integrating process improvement with “the people side” of performance. 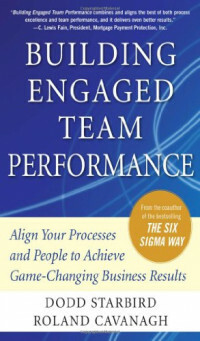 Breaking new ground in the world of organizational improvement, performance management expert Dodd Starbird teams up with Roland Cavanagh, coauthor of the bestselling The Six Sigma Way, to present a system for aligning and optimizing processes and the efforts of any organization’s most valuable asset: people. C. Lewis Fain, President, Mortgage Payment Protection, Inc.